FDR first came to Warm Springs, Georgia, during the fall of 1924, searching for a way to combat the polio that had left his legs paralyzed. He had heard from a friend who had just moved to Warm Springs that a young man who also had polio had begun to improve after swimming in the warm salt water. 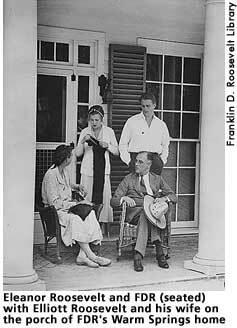 Eager to try anything that might help his lame legs gain strength, FDR traveled to Georgia, rented rooms at the Merriwether Inn and swam daily in the public pool 500 yards across from the inn. Soon, for the first time since his paralysis, FDR felt life in his toes and could walk unassisted in four-feet-deep water. (1) Amazed by the water's recuperative powers, FDR stayed for three weeks and worked with a local doctor, Dr. James Johnson, to develop a training regimen they hoped would improve his muscles. Freidel, Frank. Franklin D. Roosevelt: A Rendezvous with Destiny. Little, Brown and Company: New York, 1990, 46. Freidel, Frank. Franklin D. Roosevelt: A Rendezvous with Destiny. New York: Little, Brown and Company, 1990, 110, 124, 602-607.